There’s one single area of your business that ultimately controls how you feel towards your business. You could love your business, or feel constant stress because of it. How you feel has everything to do with one single figure. Your quality of life as a business owner could be one where you can take a month off, whenever you feel like it because you can… or you have to be there every hour your business operates. This one figure or KPI (Key Performance Indicator) determines all of this, but do you know what KPI it is? Knowing it is one thing, knowing how to increase it is another. Increasing it is actually easy… when you know how. If you don’t, then maybe this figure won’t have the importance it should for you and your quality of life. However, our clients who are trained to adopt to this figure with a “mindset” have often tripled their business’ net profit – in months, or added $350,000 to their net profit, and changed the quality of their personal life forever. Are you seeing the HUGE importance of this figure? So what is this figure? It’s your business’ Net Profit Margin. Do you know what your business’ figure is? To put it simply, its the net profit percentage your business trades with. If you divide your business’ net profit into your annual revenue/turnover you will obtain a 2 digit figure that’s your net profit margin. 90% of businesses under $700,000 annual revenue are under 10%. And that’s the number 1 reason why businesses have a cash-flow issue. There’s no money left in the bank after costs are taken out of each sale. 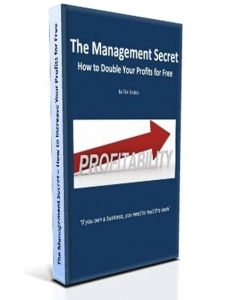 The book – The Management Secret is all about net profit margins. There is no subject, or KPI more important than this figure! The power of understanding of net profit margins is just the beginning. What to do to increase the figure, by 5% to 15% – in months – without increasing your staff, costs or marketing, is quite another. That’s what the Academy of Business Mastery is focused on. If you want to access the huge amounts of “Free Cash” lying dormant in your business, subscribe to get the book. You will also then be invited to our online training webinars (wherever you are in the world). When you’re ready and comfortable with the quality of our strategies and information, you can consider applying to attend the online Academy of Business Mastery, where all theory stops and practical tools, systems and training on implementing with guidance and support begins! 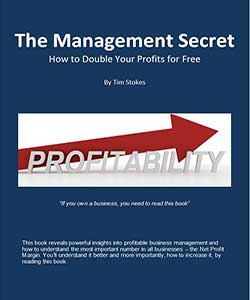 Take the first step and get “The Management Secret – How to Increase Your profits for Free” – one of our free eBooks and start benefiting today from learning all about the most important number in your business. * You’ll also receive other free training books and webinar invitations to build your business with quality information.